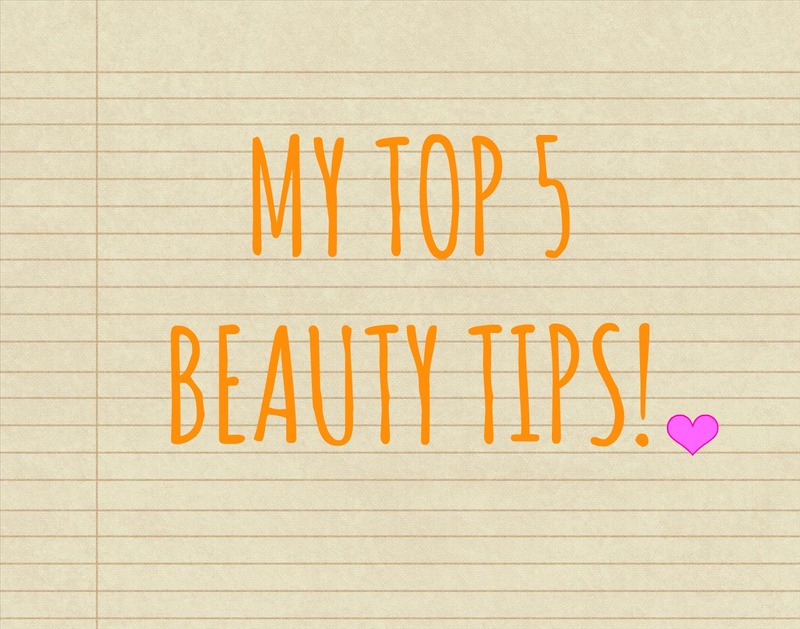 My Top 5 Beauty Tips! For today’s post, I thought I’d do something a little different. I’m going to share with you my top 5 beauty tips, some of them you may have known, maybe some of them you won’t but chat aside, lets jump straight in! Get yourself a Skincare Routine. You probably are aware of this, but it is vital that you have a skin care routine! A basic one should consist, of Cleanse, Tone, and Moisturize. But it’s best to have an exfoliater as well. This doesn’t have to cost you the world, (in fact there are some great drugstore skincare items, all my skincare stuff is drugstore!) But cleansing your skin properly makes your makeup sit better, and also gets rid of dirt which prevents acne! Set aside one day a week where you are not going to wear any makeup. If you are not going anywhere, then don’t put any makeup on. Your Skin will thank you for it! It gives your skin a break, which helps it to breathe. I have been doing this lately and I have seen a difference in my skin! Recently my lips got so dry and disgusting it literally made me sad to look in a mirror (it really was that bad- I kid you not.) I recommend using a lip scrub at least once every other day before bed to scrub away dead skin cells and make your lips super smooth! (lip products look better on smooth lips- especially dark colours!) I like to use the Lush Bubblegum lip scrub and then slather my lips with vaseline before bed. Alternatively you can use your toothbrush to rub over your lips, or make your own scrub with sugar and honey! Curl your lashes before mascara. Curling your lashes before you apply mascara makes you look much more alert and awake. It also gives your lashes a gorgeous curl and makes your mascara go on better. I can’t wear mascara without doing this now! Its best to curl them before your mascara so you don’t tug on them too much. You can get eyelash curlers really cheaply online. Set your eyebrows with hairspray! Stay with me! If you don’t have a fancy brow setting gel, then a simple way to make sure your brows don’t budge is to set them with hairspray! Simply spray some hairspray onto a spooly (or an old mascara wand- make sure it’s clean though!) And brush through your brows. Think about it, our eyebrows are hair and we use hairspray in our hair *wow Lauren, best observation ever* So it makes sense! I could probably think of a lot more, but these ones sprung to mind. Maybe in the future I will make a new list! Next Post Dainty Doll Blushes Haul! This is great! Thank you so much for sharing, I love your tips!